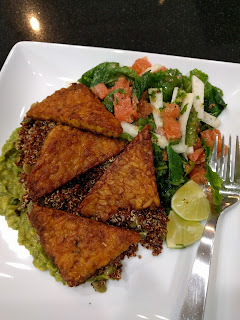 A Growing Cornucopia of Vegan Recipes and Lifestyle Possibilities. half widthwise, then halve each piece, making 4 thin squares. Cut each square diagonally into triangles, making 8 pieces. halve lengthwise, remove white ribbing, seeds, and stem, then finely chop. cut ends off, lay flat and remove peel with curved downward cuts, exposing flesh. Cut into bite size pieces. destem and finely chop leaves. cut in half, remove pit, and scoop flesh out with spoon. Add pepitas to heated pot; stir. Toast 1 minute, or until pepitas begin to brown and become fragrant, stirring frequently. Add Quinoa, Ginger, Coriander to pot. Lightly season with salt and pepper. Add 1 1/4 cups water. Reduce heat to medium-low and cover. Simmer 16-18 minutes, or until quinoa is tender and water is absorbed. Let rest, covered, 3 minutes. Drizzle with about 2 tablespoons olive oil. Heat about 1/2 tablespoon cooking oil in a large saute pan over medium-high heat. Add tempeh to hot pan. Cook 2-3 minutes, or until evenly blackened. Roast 8 minutes, or until lightly crisp. Meanwhile, peel jicama with a knife. Cut into about 1/4-inch thick strips. Remove white ribbing, seeds, and stem. Place jicama and desired amount of jalapeno (or omit) in a large bowl. Lay flat and remove peel with curved downward cuts, exposing flesh. Cut grapefruit into bite-size pieces. Destem cilantro; finely chop leaves. Add grapefruit and half of the cilantro to bowl with jicama (reserve remaining cilantro for avocado). Drizzle with 1-2 tablespoons olive oil. Scoop out flesh with a spoon. Place avocado in bowl used for tempeh. Zest with half of lime with a micro-plane (or on small holes of a box grater) over avocado. Halve lime; squeeze juice of half lime over avocado. Add about 1 teaspoon olive oil. Season with salt and peppers. Cut remaining half lime into wedges. Spread avocado mash on each plate. Top avocado with pepito-studded quinoa. Shingle blackened tempeh over top. Serve kale salad and lime wedges on the side.